The Bair Hugger system has been in use for more than 30 years and has warmed more than 300 million patients. To this date, there is not a single confirmed case of an infection caused by the Bair Hugger system. A 3M competitor has waged a misinformation campaign during the past decade, claiming the device may stir up bacteria and result in surgical-site infections. His company has encouraged plaintiffs’ lawyers to file lawsuits against the Bair Hugger warming system. 3M does not believe there is merit to any of those lawsuits, and already has won key victories in the litigation. In the first case to go to trial, a federal jury deliberated less than two hours before finding in 3M’s favor. Don’t be fooled by the misinformation campaign. The 3M Bair Hugger warming system is safe. 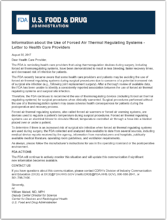 After becoming aware that some patients and doctors are not using warming blankets because of the misinformation, the U.S. Food and Drug Administration sent a letter to medical providers in August 2017, recommending that they continue to warm patients before surgery when clinically warranted.